This work from Brian Mitchell is the closest thing we have to a census for those living in the Northern Ireland city of Derry in 1921. 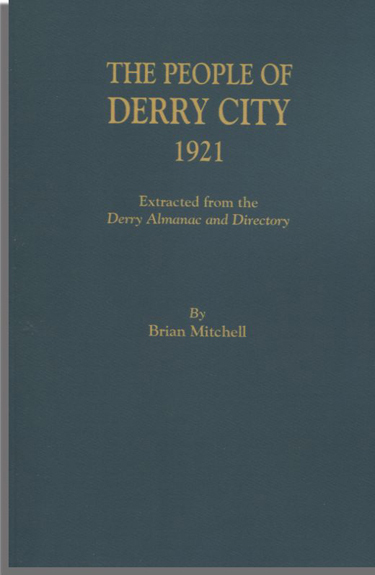 It lists inhabitants, in alphabetical order by surname, in Derry city in 1921 and contains five fields: Surname of Head of Household, First Name of Head of Household, Street Address, House Number, and Page Number of the listing in the Derry Almanac. Especially significant for Derry researchers are its references to Derry inhabitants amidst the turmoil of (1) the June 1920 six-day “civil war” between Nationalist and Unionist supporters in Derry city, which left 23 people dead and many wounded, and (2) the subsequent Irish War of Independence and Anglo-Irish Treaty, from 21 January 1919 to 6 December 1921.